Removing hardware may be more difficult than expected—both in establishing appropriate indications and performing the procedure itself. Concern regarding the long-term effect of metal implants has made hardware removal in children more common than in adults. This uncertainty must be weighed against the risks and costs of routine removal. Bioabsorbable fixation may solve these problems in the future. Absolute indications include external pins, prominent fixation that causes skin irritation, infected devices, or hardware penetrating joints. Usual indications include large fixation devices, those causing stress risers that may promote fractures, fixation considered likely to complicate operative procedures, or concern that the fixation will become encased in bone and difficult to remove later. Seldom justified are single screws, small implants, and spinal fixation devices. Contraindicated are flexible rods in osteopenic bone, fibrous dysplasia, and osteogenesis imperfecta. 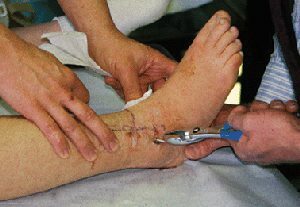 Smooth pin removal Generally, smooth pins can be removed in the clinic without sedation or anesthesia. Obtain permission from the parent, have tools ready, tell the child what is to happen, place a visual barrier, and without delay remove the pin. Cover the field with a towel to hide the inevitable bleeding, and return in about 10 minutes, once the drainage has stopped, to place a small dressing over the wound. Deep threaded pin removal The decision regarding removal should be made at the original operation. Pins to be left can be cut off at bone level. Those to be removed are left long to facilitate removal. Their length may be a source of discomfort before removal. Mark the position of the pins using fluoroscopy. Make a small incision in line with the pins to insert a needle holder, grasp the end, and remove the pin. Plates Plates may become overgrown with bone, making removal risks unacceptable. If a significant amount of bone is removed, the child may require a walking cast for a month to prevent a fracture. Fracture Refracture or a pathological fracture may occur following removal. Avoid this complication by allowing adequate time for bone strength recovery prior to removal.